Perhaps one of my all-time favorite illustrations of God is given life through the pen of C.S. Lewis in his writing of Aslan. For those who haven’t read the Chronicles of Narnia I’ll try not to ruin it. Aslan is a lion, King of Narnia and all that dwell within it. Aslan is strong, bold, honest, caring, gentle, and powerful beyond reason. He has no equal and those who dare challenge him find themselves standing before him fearing for their very lives. C.S. Lewis makes a point to emphasis the Aslan is not some tamed, talking animal, which stays and plays nice. He is a wild animal who comes when he is needed but goes as he wills asking for no pardon or permission to do so. C.S. Lewis was a Christian at the time that the Narnia book series had been written and admitted on several occasions that Aslan was meant to reflect God (or specifically the person of Jesus). Within the Church, many Christians speak of God as if he were on a leash. They limit His ability to work within His own creation by dictating the necessary criterion for it to make sense within their minds. I’ve heard many protests again more figurative reading of Revelation (or Genesis 1 for that matter) boil down to, “If Scripture is true than Revelation must be read literally, and Genesis 1 must be the exact narrative of creation or it is untrue and calls our very faith into question.” To me this is what I hear, “If Scripture is true than it must be true in accord with how I define and reference truth,” yeah…not much of an argument. Now that isn’t to say that I don’t believe Scripture to be true…I definitely do and I take it seriously…but I also don’t demand that God fit into my box. I don’t demand that God make complete sense to me, and that he do things in accord with my understanding of Him. 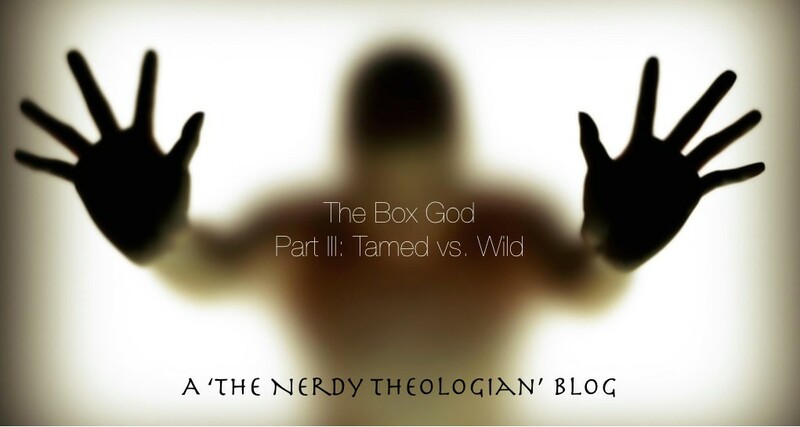 God is not tame…he is not a toothless, clawless kitten waiting to for you to pet Him. He is a wild Lion…a being who does as He wills when He wills and though He is gentle and compassionate he can also be really scary because of how powerful and unpredictable He is. He is a being that can be trusted…but only if that trust is developed and nurtured on His terms…not yours. When we train a pet, they gain our trust by obeying commands and doing as they are told…you are never going to trust God if this is your expectation. You must come to trust Him on His terms and only His terms. Also note…he is not a being to trifle with any more than a lion is. Don’t poke the lion in the eye (especially a wild one) and not expect to pay for it. What’s funny is that as I type this I am smirking at the ridiculousness of some of this. I am floored that we are all so dull as to think that we can dictate anything to God, but each of us (myself included) do try nonetheless to control the relationship. We try to tame the lion and in the end the result is always the same…we end up tired, injured, and really discouraged. Stop trying to tame the Lion…it isn’t possible…go to Him on His terms and lay your life before Him following His leading for your life. And so it is with Christ…He isn’t safe…He isn’t what you expect…but He is good and most importantly He is the King.